During the past few years I have written about people who have had strange encounters with alien or unknown beings as well as lost time events. The people involved in these events are often referred to as contactees or experiencers or abductees. They are people who are taken against their will with their lives and bodies invaded or used until they are returned confused with no or little memory of what took place. Many of these people started having strange events happen to them as small children some as young as age three. Most of the encounters are vague at best in memory while messages or ideas seem to become implanted in the minds of those taken which they in turn feel compelled to explain or share after the abduction or lost time experience. I have interviewed many people who have been through this type of event and have found many similar threads that run through this community of people. Today I want to discuss one of those similarities. Among the abduction victims I have talked to the subject of children or being used for the collection of biological material to use for a inter species reproduction project seems to be a main concern for these people. The subject comes into the conversation usually by way of the abductee as it seems to be a topic that weighs heavily on their minds. The idea of being used to produce a child or life form that is only half human and that half coming from them is an idea that pushes the abductees to a point of deep concern and fear. I have been told over and over that their worse fear would be for them to come face to face with a being that they thought was theirs by way of their abductions. I know this fear has been realized in a few cases where those who have experienced these events have an experience where either children or teens are shown to abductees without explanation. Odd looking children or teens will appear in strange places and either simply look at or speak a few words to the abductee before quickly walking away or vanish before the abductee can react to them. These odd visits leave the abductee with a deep implanted feeling that they were shown their alien hybrid children. The people who have had this happen seem to be rare, however they all were seriously shaken by the event. They are people who carry the images of these children or teens with fear anguish and upset after the experience making their life harder as they struggle wondering why they are the one who has been chosen to endure these horrid abduction experiences. I have worked with and have become friends with Randy Maugans who is the host of Off Planet Radio. Randy and I have worked together on his shows and have become friends due to the fact we share a great deal in common with our thinking and personal experiences with the unknown. Randy is a lifelong experiencer with strange events happening to him starting when he was a small child of about three. He has continued with odd events and lost time scenarios during his entire lifetime. Although Randy’s radio show covers the subjects of the unknown Randy has only recently started to discuss his own experiences recently. Randy and I were discussing a show we were preparing to work on together when I started to ask him a bit more about his own encounters. Randy floored me when he mentioned that a few years ago he had a truly upsetting experience that has kept him nervous and confused since. “I was having dinner at a Chinese takeout place one night in September 2010. The place had a covered area with tables outside. It was a nice night so I went out and sat down to eat my dinner. I was the only one there at the time eating. I was busy with my dinner when I felt someone was there or looking at me so I looked up to find two young people standing a few feet away from me. The moment I noticed them they walked right up to my table inches from where I sat, One was a teenage male in his late teens the other a teen female a bit younger, They were very strange looking. They were both on the tall side but extremely thin. They wore jeans but they did not look like a normal teen as they had on odd shirts and wore their hair unlike most kids, I know I have a house full of teenagers. They had pale skin and extremely large eyes. Their eyes were blue but way too big for their faces and skull. They had straight slit like pupils not round like ours. The boy had shaggy dark blonde hair the girl dark straight hair with a large widow’s peek. The two of them stood close and over me until the male bent down a bit and I heard in my head his voice saying "Hello, how are you?" He did not communicate this orally it was done mentally. With that the two of them stepped back and quickly took off in to the parking lot area. The Chinese restaurant is in a strip mall. The restaurant is located on the end making it the last store in the strip. I was extremely shaken at what had just happened and got up immediately and stepped out into the parking lot which I could clearly see from my vantage point and searched for them. It was only seconds that passed yet I could not see them anywhere, I knew they did not even have enough time to make it to a car much less disappear from the parking area. I walked around and looked but could not find any sign of them. I returned to my table, however I was so upset by the event that I was physically shaking and needed to calm down before I was able to drive and return to work. I knew that the two were not fully human and will tell you that one horrid thought went through my mind as I was experiencing this and every day since. The horror that flowed through my mind then and still does now is one thought - Are they mine? Once I returned to work, I immediately took notes and drew a sketch of what I had just experienced. I have to tell you that this event is one that really has and still does shake me to my bones. " Below are Randy's notes and sketch from that day. Randy Maugans' Sketch of the "Odd Couple"
Eyes: approximately 1/3 size larger than normal (the drawing is a visual representation, but not exact); (creepy) the irises of both subjects were elliptical, not round. I recall both subjects’ eyes were light-colored: the male had green-blue eyes; the female’s eyes were nearly translucent with a slight blue tint—it was quite stunning. Hard to show in the sketch, but the cranial (foreheads) were more prominent; i.e.- frontal cranium had a very noticeable protrusion. Female subject had a noticeable “widows peak”; the male, as I recall did not but the hair was also longish likely more of a forward sweep. Male’s hair was light, or blondish, the female’s hair was dark…black? Can’t say for certain now. 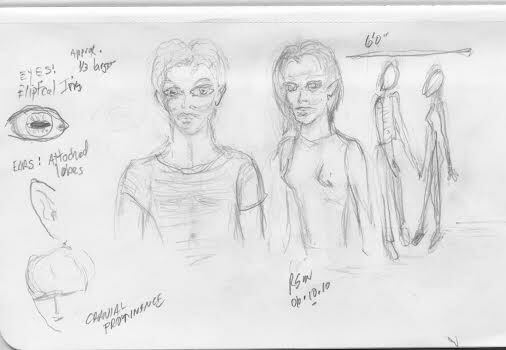 The heights of the subjects were, relative to my height (5’11-1/2”)—male around 5’11”, female around 5’8” or so (sketch, right side line sketch). When I saw Randy's sketch I was a bit shocked as many years ago I talked with a man who had a few UFO sightings in his lifetime. He was 80 years old at the time but sharp and clear in his thinking. He told me of his fear that he had alien children and also had sketched three young children about 12 who looked very much like the ones Randy drew. I wish I had kept the drawing but it was over 20 years since I last saw this man and I was not yet gathering information in the fashion I try to do now and cannot find his sketch, I do recall the three children had large eyes were very thin and also spoke to him in his head. “This man (referring to Randy) has lived my worst nightmare". 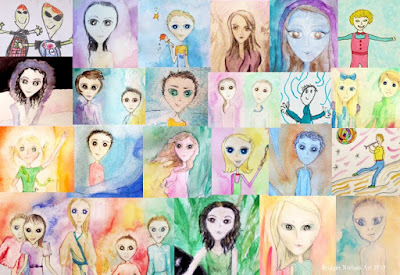 She explained that her worst fear since she had started to be taken in her late teens was that one day she too would be shown children that were alien and half her flesh and blood and the thought has terrorized her for years, I did not know how to comfort her as I think all abductees feel the same way. Randy was just chosen for some reason to be shown what may have been his. Maybe the reason Randy feels compelled to dive in to the unknown with his radio shows is due to his experiences with the unknown. Maybe his being shown the two teen beings was so Randy would discuss it and bring the idea of it out to the public to consider as the time for us to learn more truth in these matters starts to come closer and closer. It is possible that the reason those like Randy are the ones taken relates to their biology and DNA as well as blood type. Many if not most abductees whom I have come to know all share the odd "coincidence" of having the RH negative blood factor, which is rare in the overall population, but "the usual" in the abduction population. You find other factors as well including eye color and family background origins, many have Irish family lines, as well as other similar traits. I think those taken are taken not for who they are as an individual but for the body chemistry that they were born with. That also explains why many abduction cases are known to run in families . Whatever Randy encountered that night I think it all adds up to the fact that it is time we understand what is happening to so many people like Randy, and to start trying to research what is happening to them. What Randy experienced as well as all who have seen an odd craft and all those who have had experiences they cannot explain is that this is not a TV horror movie or science fiction. These are not new movie trailers we are discussing or scary stories to entertain you. We take our time to tell you these things as they happen to real people just like you all the time and we need to stop being so ignorant of things we do not understand and must start to try to grasp on to the fact that it is time to stop being ridiculous and start wanting to know what the hell is going on out there before it may just be too late. With knowledge and in strength we can continue as a species, but in ignorance and divided, we will fail. Read Chris Holly's "Endless Journey with the Unknown"
ARE YOU ADDICTED TO SMARTPHONES, OTHER AMAZING TECHNOLOGIES?